Raqs Sharqi, literally ”dance of the East” is the dance of the people of Upper Egypt as well as of the Egyptian conurbations. Traditionally it is a dance of celebration and entertainment whether in rural villages, in urban cafes or in the houses of the wealthy. Often it is an art form in which the dancer expresses a wide range of qualities from the earthy to the ethereal, but always rooted in the music and lives of the Egyptian people. 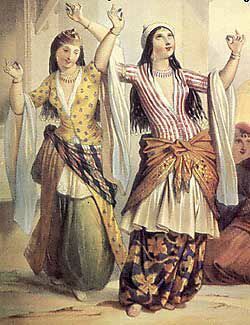 As it is an oral tradition Raqs Sharqi is constantly changing. Since the early European travellers of the mid 1800s who painted and wrote about their experiences in Egypt, the changes to this dance have become increasingly dominated by Western influences and tastes. The Shaabi form in the Saiid (Upper Egypt) has persisted, but throughout the country pop music and dance has become the preferred entertainment. Belly dance, a Western hybrid imported into Egypt and widely seen by tourists in hotels and nightclubs is what most people in the West think of when hearing the term Egyptian dance. In the 1980’s however, among a small number of dancers in Europe there was a growing realisation that Raqs Sharqi offered far more than this popularised cabaret version. Focused around the charismatic Egyptian performer, Suraya Hilal – trained in contemporary western dance – they began to draw together and explore the subtle and unique dance form that we now know as Raqs Sharqi. This is the dance which Liza Wedgwood performs and teaches today.